I am appalled by the release of hundreds of thousands of classified U.S. military and diplomatic cables by the Wikileaks organization. While Julian Assange's organization may not technically be breaking the law, it does major damage to our ability to prosecute two wars and conduct foreign policy around the world. The real culprit appears to be Army Private First Class Bradley Manning, a 22-year old intelligence analyst who has no clue what harm he has done. He, of course, has violated the Uniform Code of Military Justice and will be court-martialed. Manning is currently in custody in Quantico, Virginia, where he is being held in solitary confinement, probably for his own safety. He has initially been charged with "transferring classified data onto his personal computer and adding unauthorized software to a classified computer system" and "communicating, transmitting and delivering national defense information to an unauthorized source." The maximum sentence for those two offenses is 52 years. I suspect that if the leaks can be tied to the arrest, imprisonment, mistreatment or death of an American information source, Manning will be tried for additional, more serious violations. Personally, I hope he is found guilty of treason in a time of war, a capital offense. At the very least, he should spend the rest of his days bolted into a concrete box. Thankfully, given Attorney General Eric Holder's track record on prosecutions, this will be tried in a military court where the chances of a conviction are good. That said, the recent tranche of diplomatic cables released by Wikileaks shows the depth of concern among many of our regional allies over Iran. Iran is now regarded as the world's major state sponsor of terrorism and the biggest threat to regional stability in the volatile Persian Gulf. I'll forgo Israeli concerns over Iran. These concerns have been well-documented already since Israel has made no secret that it regards a nuclear-armed Iran as an existential threat. Many of the Tel Aviv cables in the released documents again point this out, including requests for GBU-28 5000-pound "bunker buster" bombs. These munitions will be required if Israel plans to attack Iran's hardened nuclear facilities. - "King 'Abdullah believes we are not always reliable, consistent, or willing to heed his advice on important issues such as Iraq. 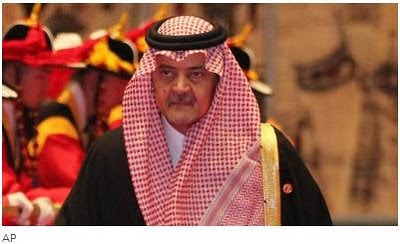 Sa'ud Al-Faisal and others have openly been critical of U.S. policies they describe as having shifted the regional balance of power in favor of arch-rival Iran." - "Saudi Arabia is thinking through how best to take a leaf from the Chinese playbook and use these expanded trade ties to achieve important political goals. In this regard, Saudi Arabia has told the Chinese that it is willing to effectively trade a guaranteed oil supply in return for Chinese pressure on Iran not to develop nuclear weapons." Riyadh-Cairo-Damascus coordination, supporting Palestinian reconciliation, supporting the Yemeni government, and expanding relations with non-traditional partners such as Russia, China, and India to create diplomatic and economic pressure on Iran that do not directly depend on U.S. help. 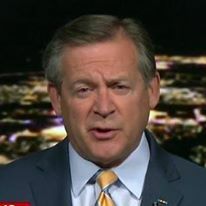 - "The King told General Jones that if Iran succeeded in developing nuclear weapons, everyone in the region would do the same, including Saudi Arabia." - "The King is convinced that current U.S. engagement efforts with Tehran will not succeed; he is likely to feel grimly vindicated in his view by Ahmadinejad's February 11 boast that having successfully enriched uranium to a level of 20 percent, Iran 'is now a nuclear nation.' The King told General Jones that Iranian internal turmoil presented an opportunity to weaken the regime -- which he encouraged -- but he also urged that this be done covertly and stressed that public statements in support of the reformers were counterproductive. The King assesses that sanctions could help weaken the government, but only if they are strong and sustained. The King will want you to elaborate on the President's statement that the time for sanctions has come. He will also want to hear our plans for bolstering Gulf defenses vis a vis Iran." 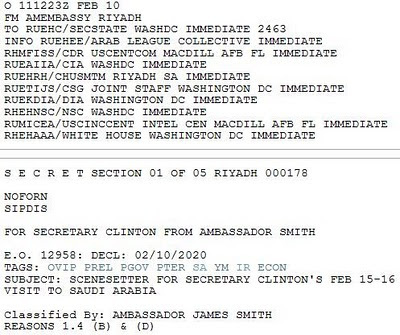 Another secret cable from the U.S. embassy in Riyadh quotes the Saudi ambassador to the United States 'Adil al-Jubayr citing the Saudi king's "frequent exhortations to the US to attack Iran and so put an end to its nuclear weapons program. He told you to cut off the head of the snake.'" After the cables were made public, Mrs. Clinton remarked, "I think that it should not be a surprise that Iran is a source of great concern, not only in the U.S. The comments reported in the cables prove that Iran poses a serious threat in the eyes of its neighbors, and beyond the region." She missed the point that most of the comments are not supportive of President Obama's lenient engagement policy toward Iran. In a somewhat surprising and no doubt embarrassing revelation, Lebanese Prime Minister Sa'ad al-Hariri was quoted in a cable that he supported military strikes on Iran's nuclear program. Of course, things have changed and he denies ever saying it. Egyptian President Husni Mubarak also was quoted disparaging Iran. President Obama is allegedly a big proponent of "transparency." One of his first executive orders when he took office in 2009 dealt with the classification system and his desire that only things absolutely requiring secrecy be restricted from the public. I wonder what he thinks now that less than one-tenth of one percent of the over 250,000 documents to be released have come to light. More importantly, these documents clearly show that most of our allies in the region are wary of Iran and are skeptical of the President's attempts (which all have failed) to engage the Iranians diplomatically. As the Saudis point out, he doesn't listen. The face of the TSA - why doesn't this make me feel safe? Much attention is being paid to the U.S. Department of Homeland Security's airport security organization, the Transportation Security Administration. It needs to be under tough scrutiny. It is another bloated, ineffective federal bureaucracy inside a larger bloated, ineffective and unnecessary federal department. No one can point to any successful TSA operations to secure civil aviation in the United States. This is because the agency is hampered by its own self-imposed politically correct restrictions, its refusal to adopt proven screening techniques and probably most important, it's ability to attract only the most inept and incompetent employees. As I have said in the past, "it's the same morons but now with federal benefits." Now they are led by what appears to be an incompetent John Pistole, but an arrogant incompetent John Pistole. Contrast this farcical theater with the screening conducted by the Israelis for all El Al flights worldwide, and for other airlines' flights departing from Ben Gurion airport in Tel Aviv. I have gone through Israeli security many times over the last three decades. It appears to work. You get the sense that the security personnel are actually trying to provide effective screening, as opposed to the feeling that the TSA merely provides the illusion that they are preventing attacks on aviation. Granted, El Al only has a fleet of about 30 aircraft and does not have to deal with the volume of passengers that TSA faces, but TSA has ballooned to over 60,000 federal employees. Israeli security is multi-layered, thorough and professional. As you approach Ben Gurion, there is a checkpoint before passengers even enter the airport. A police officer looks in the vehicle and determines whether or not the occupants have business at the airport. This usually involves producing a passport and/or ticket, and may involve a cursory check of the trunk for luggage. As the vehicle approaches the terminal, there are both uniformed and plain-clothes security officers observing as passengers move toward the entrance, watching for suspicious behavior. If any questionable behavior is suspected, the passenger is stopped and questioned before he/she even gets to the door of the terminal. Once inside the terminal, every passenger is interviewed by a security officer. This initial screening involves a document check and a rudimentary threat assessment. For most travelers, this is done quickly. For those with certain indicators in their documents, there is additional screening. I have experience with both outcomes. Once the officer saw these stamps, she called another officer to ask more questions. Why had I traveled to these countries, who did I meet in these countries, what was my reason for being in Israel, who had I met with in Israel, what hotel did I use, etc. 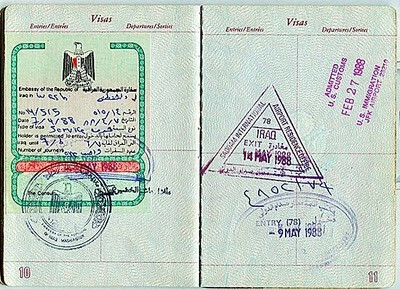 Generally I could point to the passport which was clearly marked as an official passport and explain all travels indicated by the visas and stamps were on behalf of the United States government. On later occasions when I was traveling with a new passport without all the stamps and carrying a letter from whatever American Jewish groups that had sponsored my visit to Israel, I was given only a cursory review. All baggage is then checked before passengers are allowed to go to the ticket counter. Once there, the agent checks travel documents against the electronic records and issues a boarding pass. Then passengers proceed to immigration where the passports are run through a data base. Only then are the passengers allowed to move to the gate area. Throughout this entire process, observation by trained security officers continues. The Israelis get it: profile and be safe. 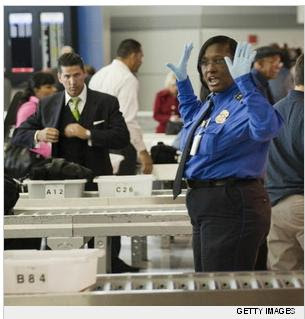 The TSA does not: put on a show and create the illusion of security. In one of those "under the radar" news reports that most people ignore, there was a reminder of an issue that will confront Saudi Arabia in the near future - the succession to the throne of the oil-rich kingdom. Given the close relationship between the United States and the Kingdom of Saudi Arabia, it is in America's national interest that there continues to be smooth transitions of power in Riyadh. When the kingdom was founded in 1932 by 'Abd al-'Aziz bin 'Abd al-Rahman Al Sa'ud (more commonly called "ibn Sa'ud"), the succession was established as the sons of ibn Sa'ud. Normally the oldest surviving son was the first choice. When a king dies, the surviving sons of ibn Sa'ud gather and select the new king by consensus. That system has been in place since the death of ibn Sa'ud in 1953. With 37 sons, there did not seem to be any urgency to provide for further succession. However, the youngest of ibn Sa'ud's sons (Muqran bin 'Abd al-'Aziz*) is now 65 years old. At some point, the family will need to address how they select a monarch from the next generation. Given the number of sons and the resulting number of grandsons of ibn Sa'ud, it may cause divisions in the family. There are already rivalries among the various groups based on their different mothers. The frailty of the current king is apparent. Last week, King 'Abdullah turned over command of the Saudi Arabian National Guard to his son. The 86-year old monarch had been the commander of the SANG since 1962 and was responsible for turning it into an effective fighting force. The 2nd SANG Brigade did well in the Battle of al-Khafji against Iraqi forces in 1991. The National Guard is composed of 260,000 men, mostly drawn from desert tribes, while the regular Saudi army is made up of men primarily from the urban areas. 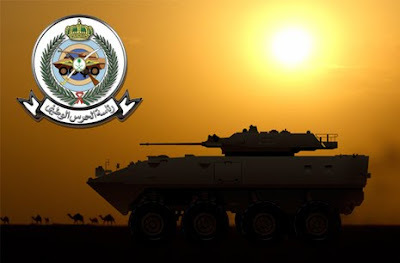 The SANG was developed as a personal protection force for the king and royal family, and has developed into a credible counterbalance against any internal threats emanating from the Saudi military. The Al Sa'ud have always been concerned with regime (read: family) protection. When I was in Saudi Arabia for Desert Shield and Desert Storm, we spent an inordinate amount of time answering intelligence requests from the Saudis about numerous improbable threats to the king and other members of the royal family. How the family handles the succession issue may well decide what threats appear to the continued reign of the Al Sa'ud. * Prince Muqran bin 'Abd al-'Aziz is the third youngest son and the youngest surviving son of ibn Sa'ud. He is currently the Director General of the Saudi General Intelligence Directorate. See my earlier article, Saudi intelligence warnings - seriously? In what might be the initial acknowledgment that the scheduled withdrawal of American forces from Iraq might be premature, Secretary of Defense Robert Gates stated that he was open to keeping troops in Iraq beyond the 2011 deadline. If that were to happen, the Iraqi government would have to request it in accordance with an agreement between the United States and Iraq. Part of the 2008 status of forces agreement between Iraq and the United States calls for the withdrawal of all American forces from Iraq by the end of 2011. The United States, in response to a political decision by the Obama Administration, allegedly withdrew all of combat units from Iraq in August of this year. I'll forgo the redesignation of combat brigades to "advisor brigades" as part of this charade, but much of the U.S. Army's combat power was removed from the country. Almost immediately after the last Stryker brigade left the country, internecine violence escalated in the country. The violence was especially concentrated against Shi'a religious targets, an obvious attempt by the remaining al-Qa'idah in Iraq (AQI, also known as al-Qa'idah in Mesopotamia) elements to re-ignite the sectarian violence that served them well prior to the U.S. surge of late 2007 and early 2008. Events in Iraq only serve to highlight the folly of specific timetables for withdrawal of combat forces. While such timetables and deadlines make for excellent political soundbites, they do not take into consideration the reality on the ground. When you announce a timetable in military operations, you have basically handed your enemy the information he needs to continue the fight. In counterinsurgency operations, this is deadly. In Afghanistan, the situation is similar. The much-publicized June 2011 date has emboldened the Taliban and intimidated the government of President Hamid Karzai into talks with the jihadist organization. More importantly, the withdrawal date has put American troops at greater risk as villages in the disputed areas are reluctant to cooperate with American, NATO and Afghan forces. They believe, possibly legitimately, that the troops will not be there in the future; they know full well that the Taliban surely will be. Many have assessed that the United States and NATO do not have the necessary political will to stay the course. As long as we as a country continue to establish these politically-expedient, militarily-senseless arbitrary timetables, we not only jeopardize the success of our foreign policy objectives, we put American troops at risk. Eight months after the parliamentary elections in Iraq, the three major parties have agreed to form a new government based on a power sharing arrangement that maintains both the incumbent prime minister and president in their positions. Usamah al-Nujayfi, a member of the party that actually won the most seats in the elections, the al-Iraqiya alliance, is relegated to fill the position of speaker of the national assembly. The "kingmakers" in this convoluted arrangement are the Kurds. 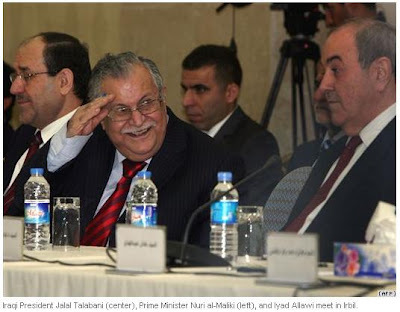 The Kurds, at the behest of Iraqi President Jalal Talabani, himself a Kurd, allied with the party of Prime Minister Nuri al-Maliki to put together a coalition with enough seats to form a new government. Although Iyad 'Alawi's al-Iraqiya party won two more seats than the al-Maliki's State of Law party, 'Alawi was not able to convince the Kurds to join him in forming a government. The Kurds feel that their interests will be better served through an alliance with the Shi'a-dominated coalition of al-Maliki, and unfortunately, rabid anti-American cleric Muqtada al-Sadr. The Kurds, who suffered under the Sunni-dominated Ba'th Party rule of Saddam Husayn, are wary of trusting the Sunnis again. The Sunnis were a major part of the al-Iraqiya alliance, although 'Alawi himself is a moderate Shi'a. The future status of the city of Kirkuk is also an issue - the Kurds, Sunni Arabs and Turkmans are all claiming it as rightfully theirs. The Kurds may have secured support from al-Maliki's party for the Kurdish desire to incorporate Kirkuk into the Kurdish autonomous region. This will be a divisive issue in the country. While it is obvious that Nuri al-Maliki is a winner under this arrangement, after all he retains the post of prime minister, there are others that gain as well. Radical cleric Muqtada al-Sadr further legitimizes himself as a key political power in the country and possible successor to al-Maliki. However, the biggest winners in this power-sharing agreement are the Iranians. Both al-Maliki and al-Sadr are heavily influenced by Iran. 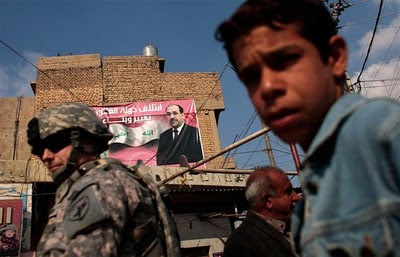 (See my earlier piece, Iraq - the consequences of another term for al-Maliki. As a sort of consolation prize for Iyad 'Alawi, a new government body was created, the National Council for Strategic Policies, which will oversee security in the country. It is expected that 'Alawi himself will head up that organization. All in all, as President Talabani designates Nuri al-Maliki to form a new government, the biggest celebrations are likely to be in Tehran, not Baghdad. More Obama appeasement of Iran? The sign in this AP photo is not translated accurately. 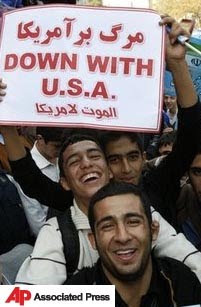 Both the Farsi above the English "Down with America" and the Arabic below it are more correctly translated as "Death to America," which has a slightly different connotation. In another step in the Obama Administration's policy to "engage" Iran, the U.S. State Department designated the Jundallah ("soldiers of God") group as a terrorist organization. This may or may not be the case - as political scientists are wont to say, "One man's terrorist is another man's freedom fighter." During the Clinton Administration's attempts to overthrow the regime of Saddam Husayn (an effort in which I was a participant), the United States worked with groups whose tactics were similar to those of the Jundallah. It was acceptable then, but not now? The Iranian government has demanded that the United States name Jundallah as a terrorist organization. It appears that the American government acquiesced to the Iranian demand, despite the fact that Iran refuses to abide by numerous United Nations resolutions over its nuclear program, despite the fact that Iran is has been holding young American hikers for over a year and intends to try them as spies, despite the fact that Iran continues to threaten American ally Israel with destruction - the list goes on and on. Just what behavior is the Obama Administration seeking to reward? Perhaps it is Iran's blatant attempts to appear cooperative by suggesting the resumption of negotiations over the Iranian nuclear issue. This is merely another iteration of the tactic of delaying the West from taking any real action while Iran continues to enrich uranium. At some point, Iran will no longer have to delay, they will announce that they are in possession of a nuclear weapon. I wonder how State Department spokesman P.J. "Spinner" Crowley will then characterize yet another foreign policy failure. Crowley's statement over the Jundallah was interesting. "This move was not made to curry favor with the Iranian government.... This group is engaged in terrorism and it's trying to destabilize a sensitive region of the world." This "sensitive region of the world" - most of us call it Iran - is the problem. Perhaps we should be supporting these groups to force regime change to Iran, rather than legitimizing an autocratic dictatorship by sitting at a negotiating table with them. How did the Iranians react to this spineless gesture on the part of the American administration? Thousands of Iranians mounted a mass demonstration with chants of "Death to America" marking the 31st anniversary of the capture of the American embassy in 1979. So I ask the Administration again, "How's that engagement policy working out?" Please point to one, just one, any, positive outcome that your Iran policies have caused. I know the answer, but do you?